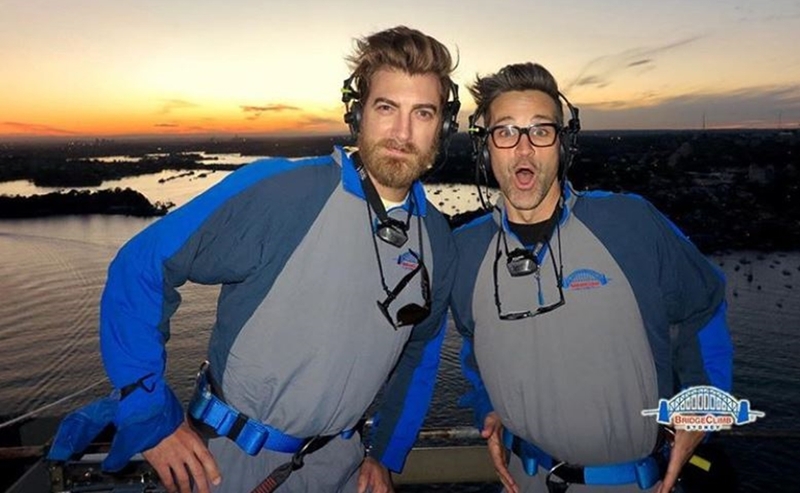 YouTube hosts Rhett McLaughlin and Link Neal have turned to a decidedly old-school marketing format to promote their new-media smash Good Mythical Morning. In order to spread the word about the daily YouTube talk series, which they claim is the internet’s most-watched morning show, the best friends and business partners have launched a nationwide billboard campaign. The campaign is a satirical nod to local news station advertising — with the implication that TV news is almost comedically nostalgic at this point. Billboards are set to run through the month of September with one in each of the 50 states, situated in unusually-named cities — except, due to local laws, in Maine, Vermont, Alaska, and Hawaii. In these states, ads will appear on buses, buildings, and airports. On the billboards, McLaughlin and Neal are dressed like stereotypical news anchors with suits that have actually been painted onto their shirtless torsos. Each billboard proclaims Good Mythical Morning‘s massive popularity across the nation — from Weedpatch, Calif., to Buttzville, N.J., to the duo’s hometown of Buies Creek, N.C. The campaign, which will also comprise a social media component — whereby McLaughlin and Neal will encourage fans to track down the billboards and share photos on Instagram, Facebook, and Twitter using the hashtag #MythicalUSA — coincides with the 14th season of Good Mythical Morning, which dropped on Aug. 20. The daily talk show, which nets 100 million monthly views and has attracted guests like Kobe Bryant, Post Malone, and Amy Schumer, received a funding supercharge from YouTube itself late last year as part of the platform’s bid to develop more ad-supported originals. And this isn’t Rhett & Link’s first foray into buzzworthy ad initiatives. Earlier this year, the duo appeared in a Super Bowl commercial for website builder Wix.